If you want to practice that wacky German time-telling, try italki. They connect you with trained teachers through Skype, and speaking is the best way to learn fast! Five past halfway to six? What is it? 5:35? Yes, precisely! "Fünf nach halb sechs" = 5.35. Similarly in Danish: "fem minutter over halv seks" (five minutes over half six, as it were). :DDD Yes, this is us! As a Dutch learner, it's the same in Dutch. Silly west Germanic languages. You know English is a West Germanic language, right? That wacky "three-quarters eight" is also found in the north-east (e.g. Berlin). I can kind of handle that by mentally translating to my accustomed "quarter before eight", but "quarter four" = 3:15 always makes me have to think for a while. Wacky dialect speakers! That should be "quarter after three", of course. Another difference is which auxiliary verb to use: the south + Austria uses "to be" more than the north does, so while both agree that it's "ich bin aufgestanden" (I got up), the north says "ich habe gestanden" (I have stood) while the south says "ich bin gestanden, ich bin gesessen, etc. ", which sounds odd to me. Though with some it's variable for me, e.g. "ich bin geschwommen, ich habe geschwommen". 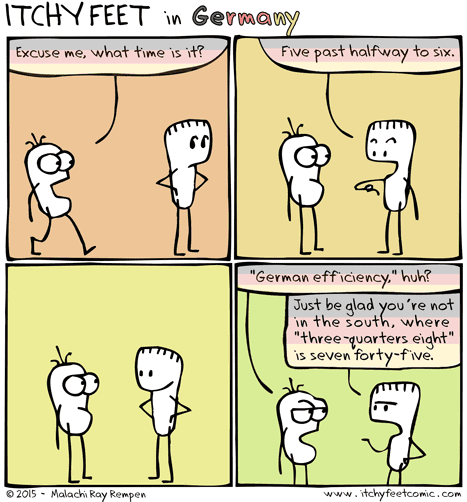 On the other hand, that enables southerners to distinguish between "ich bin gestanden" (I stood; from "stehen") and "ich habe gestanden" (I confessed; from "gestehen"); in the north, "ich habe gestanden" has to do double duty for both. Philip Newton, I'm from Northern Germany too. Gramatically you are right when you say, that ""ich bin gestanden" (I stood; from "stehen") and "ich habe gestanden" (I confessed; from "gestehen"); in the north, "ich habe gestanden" has to do double duty for both." However, I never heard anybody say the sentence "Ich habe gestanden" in the meaning of somebody stood somewhere. We would just use the Präteritum, like the simple past in English. And sometimes the "be" form just does not make sense. I am beautiful. I am ...years old. I am small. I am happy. I am a swimmer. Ich bin schön, Ich bin...Jahre alt, I bin klein, Ich bin glücklich, Ich bin ein Schwimmer. That makes sense. And then: Ich bin gesessen. You are what??? I am sat. You are sat? You are sat down? I am sat down. To be/sein, should describe a personality or character trade, something you measurably are, something you have become maybe. So sometimes this more "southern" forms of the usage of "sein" when they should use "haben", are not logical to me. You can't explain auxiliary verbs in terms of logic. "to have" means to possess something, but then what does it mean if you say "I have seen him": "I possess the seeing of him"? That makes no sense. And "werden" means "to become" (Ich werde krank, mein Sohn wird morgen 7), so what does "Ich werde morgen singen" mean - I will turn into singing? Just like "Ich bin gestern zu spät zur Arbeit gekommen", even though coming too late to work that day is neither a personality nor a character trait. @anonymous: verbs of movement always use "sein" as an axiliary verb: "Ich bin gegangen" means "I have walked", not "I am walked". Southern German includes some verbs of non-movement like stehen, sitzen, bleiben (do notherners say "ich haben geblieben? - I think not) in this rule. Other verbs slightly change their meaning when using different auxiliary verbs: "Ich bin gefahren" is used as normal past tense while "ich habe gefahren" is used if you add an accussative object, like "Ich habe den Laster gefahren" or "Ich habe meinen Onkel nach Hause gefahren". So we need to combine the Thai system of telling the time with Hindi numerals. What is the Thai system for telling time? I'm curious now. Thai uses a 6 hour clock instead of our 12 hour clock, so they divide 24 hours into 4 pieces (1-6, 7-12, 13-18, 19-24) similar to the English a.m. and p.m. I don't know why that should be 'most difficult', it's just different. From 7 p.m. to 11 p.m., you add the word ทุ่ม(thoom) behind the number, but 7 p.m. is หนึ่งทุ่ม (neung thoom), and หนึ่ง means one, so basically 7 p.m. is the first thoom, 8 p.m. the second, 9 p.m. the third, 10 p.m. the fourth and 11 p.m. the fifth. And lastly, 12 a.m. = เที่ยงคืน. Nice, as always. In regards to your last panel: Nobody seems to get this, but it is actually the most logical way to tell time if you agree that 'halb acht' is the usual way to say 07:30. Think like 07:00 + 'one hour half full'. Then it is logical that 'viertel acht' is 07:00 + 'one hour a quarter full', 'dreiviertel acht' is 07:00 + 'one hour three quarters full'. viertel sechs, halb sechs, dreiviertel sechs. Completely logical in itself. Because 4 syllables are so long... The problem comes from the translation, not the inherent shortness of the german behind it. If you're into that kind of stuff check out www.atlas-alltagssprache.de ! Oooh... thanks for the recommendation!